Email can be a real problem—reading it all, responding in a timely manner, keeping the inbox uncluttered and organizing messages so they can be retrieved later, if need be. And even if you don’t get hundreds of messages a day, most people feel some frustration with email, particularly if you’re trying to deal with it when you’re away from your computer. For me, nothing is more bothersome than having to respond to a critical message using my phone. Instead of tapping an important reply on my handset’s tiny keyboard or using Android’s speech-to-text (which inevitably messes up what I’m trying to say), what I’d rather do is send a pre-written response alerting the sender I’m currently working on something that prevents me from replying immediately. Then, ideally, I’d like to receive that important missive later, when I’m back at my computer and keyboard and ready to give it the attention it deserves. The good news is there are several good apps for iOS and Android that let you do such things, and more. Here are a few to check out. It’s easy to connect this app to your email service, particularly the most popular ones—Yahoo, Hotmail and Gmail—and is just a matter of installing it and inputting your email login credentials. From there, the app sets up a smart inbox that includes messages that might require attention, or ones you might need to return to later. What’s nice about AquaMail is it’s highly customizable. You can sort messages in a myriad of ways such as by date and time in reverse (in case you suspect you might have missed an older message), by sender or starred messages, or by attachments—meaning you prioritize the ones than include them. The color scheme is adjustable, and you can turn on handy features such as a two-panel interface that looks nice on tablets, or night mode, which disables sounds and vibration. You can create custom quick responses you can tap to add to messages such as “I’m traveling and won’t be able to respond as quickly as usual” or “I’m running errands but will read your email later today.” Other options include the ability to request a read receipt so you know when someone opens your message, as well as the ability to mark a message as high priority. 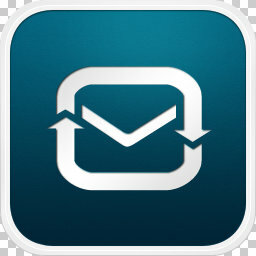 The free version lets you connect two email accounts and includes in the signature a line about how your mail is sent using AquaMail. To get rid of that promo, or to sync more accounts, you can ante up for the paid version. 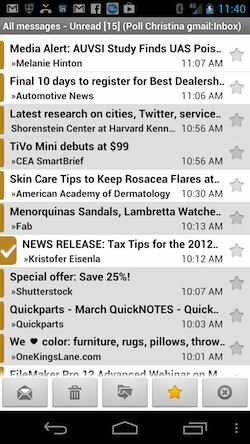 Free or $4.95 for Aqua Mail Pro Key in Google Play. This one is different because it’s both an email client and to-do list maker. 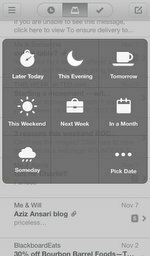 Taskbox lets you swipe messages to quickly send them to trash, spam or archive, but even better it lets you turn them into tasks. You can prioritize these tasks, give them due dates and assign them to people as well as sort them according to when they were received, their level of priority or when they’re due. It also lets you manually order your messages, so if you want to make sure you don’t forget about a particular message, you can put it on the top of the pile. Currently only works with Gmail and Google Apps accounts. If your sanity depends on having an inbox that’s free of unread messages, this app is for you because it lets you resend messages to yourself at a later point in time when you’ll have the time to give them proper attention. What’s great about Mailbox is it optimizes your email interface for mobile and makes dealing with messages super-fast. Instead of checking boxes and tapping several fields so as to organize messages into folders, Mailbox lets you quickly swipe messages to your trash or archive, as well as “snooze” emails until later, which makes them disappear and return later, when you’re ready for them. While Mailbox is currently only for Gmail users, the developer, Orchestra, says compatibility with other platforms is coming soon. Mailbox is popular, so downloading it only reserves your spot in line to actually get it live on your mobile device. Apparently Orchestra is trying to ward off server issues that might ensue if the masses all sign up at the same time. This Android app is useful because it can sync with multiple accounts and display them in a unified inbox. You can open a message and then move to earlier or later messages with simple arrow keys, or organize messages in list view by swiping them to the right to delete, archive or move them to folders. The user interface is simple and clean and allows for plenty of customization within the settings menu. 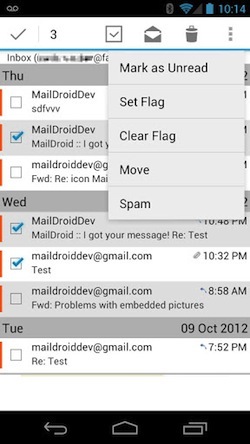 This is fresh email client that's not just a variant of Android's stock version. It has several nice features, such as the ability to save email attachments to an SD card, set up a generous number of custom mail rules and tack a signature onto the end the emails you send. 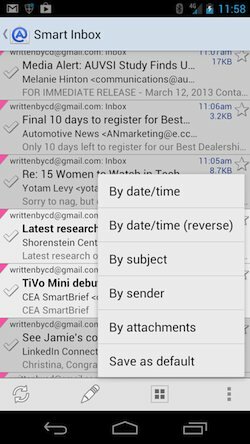 MailDroid also comes with spell check, a WYSIWYG editor, a split screen for tablets and integration major cloud storage providers, such as Dropbox or Google Drive. This one is a little different because it’s a service you add on to your email account that analyzes your messages and moves unimportant ones out of your inbox into a separate folder. To save storage space it scans emails for attachments, puts them on Dropbox, and replaces them with a link. You can improve SaneBox’s accuracy by connecting it to Facebook, LinkedIn and Twitter so it has a better idea which people are most important to you. 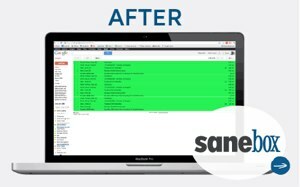 You can also put messages into special folders that do helpful tricks: The SaneBlackHole folder banishes senders from your inbox and puts their messages directly in the trash and SaneTomorrow, SaneNextWeek or Custom Defer folders push an email back into your inbox at the appropriate time in the future. And if someone doesn’t reply to one of your messages by a certain time SaneBox will let you know so you can follow up. Plans range from $2.04 to $19.54 a month, but you can try it for two weeks for free. Unroll.me has been a lifesaver for me. It saves me about an hour a day/seven hours a week. Brilliant idea for saving time via email to take out all the mass emails and condense them into one recap. Here is a very (Swedish and)intelligent service u can download via AppStore or Google Play. SpamDrain lets you blacklist and whitelist senders. Simple to use and will take all unnecessary e-mails and newsletters out. Highly recommended.